The continued use of polemic, not science; the creative use of rhetoric and facts out of context, political evasions and likely more appeals to emotion will likely frame the mainstay of the denialist argument. Why? The answer seems to lie in the nature of the political process and the short term election cycle along with the connection to campaign funding practices and special interests. Understanding the science remains paramount in achieving meaningful progress. First, here is the update of the graph showing the annual mean anomalies from the IPCC AR4 models plotted against the surface temperature records from the HadCRUT3v, NCDC and GISTEMP products (it really doesn’t matter which). Everything has been baselined to 1980-1999 (as in the 2007 IPCC report) and the envelope in grey encloses 95% of the model runs. The El Niño event that started off 2010 definitely gave last year a boost, despite the emerging La Niña towards the end of the year. An almost-record summer melt in the Arctic was also important (and probably key in explaining the difference between GISTEMP and the others). Checking up on our predictions from last year, we forecast that 2010 would be warmer than 2009 (because of the ENSO phase last January). Consistent with that, I predict that 2011 will not be quite as warm as 2010, but it will still rank easily amongst the top ten warmest years of the historical record. Short term (15 years or less) trends in global temperature are not usefully predictable as a function of current forcings. This means you can’t use such short periods to ‘prove’ that global warming has or hasn’t stopped, or that we are really cooling despite this being the warmest decade in centuries. The AR4 model simulations are an ‘ensemble of opportunity’ and vary substantially among themselves with the forcings imposed, the magnitude of the internal variability and of course, the sensitivity. Thus while they do span a large range of possible situations, the average of these simulations is not ‘truth’. Differences between the temperature anomaly products is related to: different selections of input data, different methods for assessing urban heating effects, and (most important) different methodologies for estimating temperatures in data-poor regions like the Arctic. GISTEMP assumes that the Arctic is warming as fast as the stations around the Arctic, while HadCRUT and NCDC assume the Arctic is warming as fast as the global mean. The former assumption is more in line with the sea ice results and independent measures from buoys and the reanalysis products. There is one upcoming development that is worth flagging. Long in development, the new Hadley Centre analysis of sea surface temperatures (HadISST3) will soon become available. This will contain additional newly-digitised data, better corrections for artifacts in the record (such as highlighted by Thompson et al. 2007), and corrections to more recent parts of the record because of better calibrations of some SST measuring devices. Once it is published, the historical HadCRUT global temperature anomalies will also be updated. GISTEMP uses HadISST for the pre-satellite era, and so long-term trends may be affected there too (though not the more recent changes shown above). 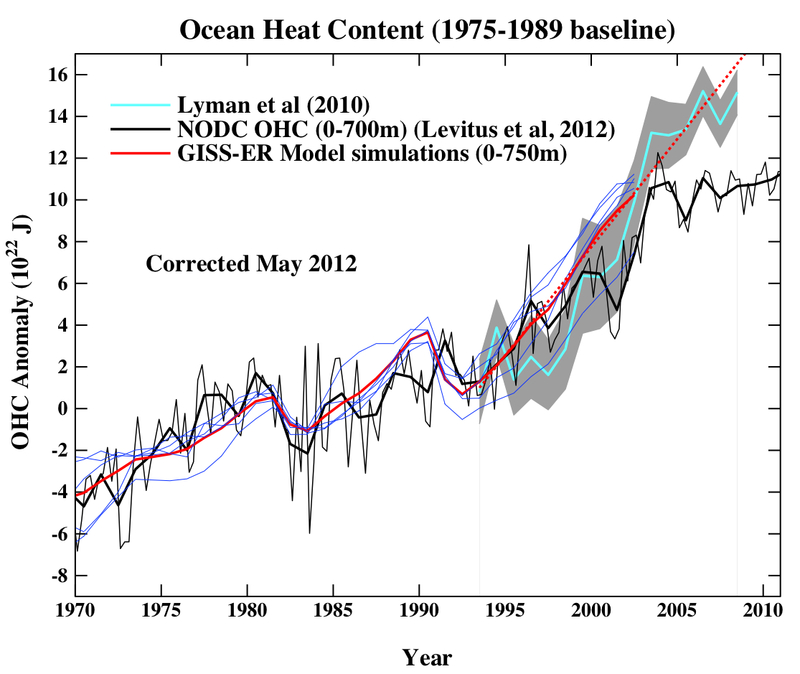 The next figure is the comparison of the ocean heat content (OHC) changes in the models compared to the latest data from NODC. As before, I don’t have the post-2003 model output, but the comparison between the 3-monthly data (to the end of Sep) and annual data versus the model output is still useful. To include the data from the Lyman et al (2010) paper, I am baselining all curves to the period 1975-1989, and using the 1993-2003 period to match the observational data sources a little more consistently. I have linearly extended the ensemble mean model values for the post 2003 period (using a regression from 1993-2002) to get a rough sense of where those runs might have gone. As can be seen the long term trends in the models match those in the data, but the short-term fluctuations are both noisy and imprecise. In this case, the match is not very good, and possibly getting worse, but unfortunately it appears that the models are not sensitive enough. 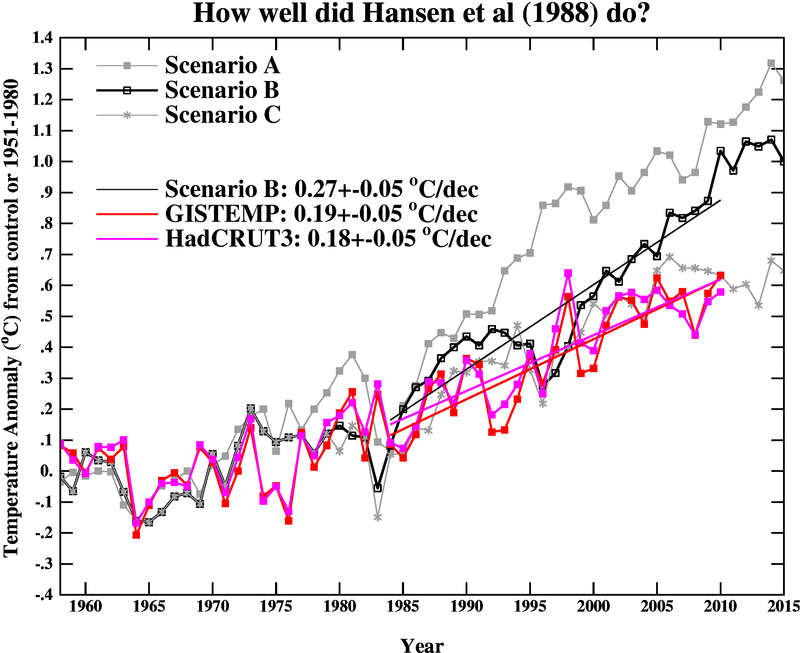 Finally, we update the Hansen et al (1988) comparisons. As stated last year, the Scenario B in that paper is running a little high compared with the actual forcings growth (by about 10%) (and high compared to A1B), and the old GISS model had a climate sensitivity that was a little higher (4.2ºC for a doubling of CO2) than the best estimate (~3ºC). The trends for the period 1984 to 2010 (the 1984 date chosen because that is when these projections started), scenario B has a trend of 0.27+/-0.05ºC/dec (95% uncertainties, no correction for auto-correlation). For the GISTEMP and HadCRUT3, the trends are 0.19+/-0.05 and 0.18+/-0.04ºC/dec (note that the GISTEMP met-station index has 0.23+/-0.06ºC/dec and has 2010 as a clear record high). 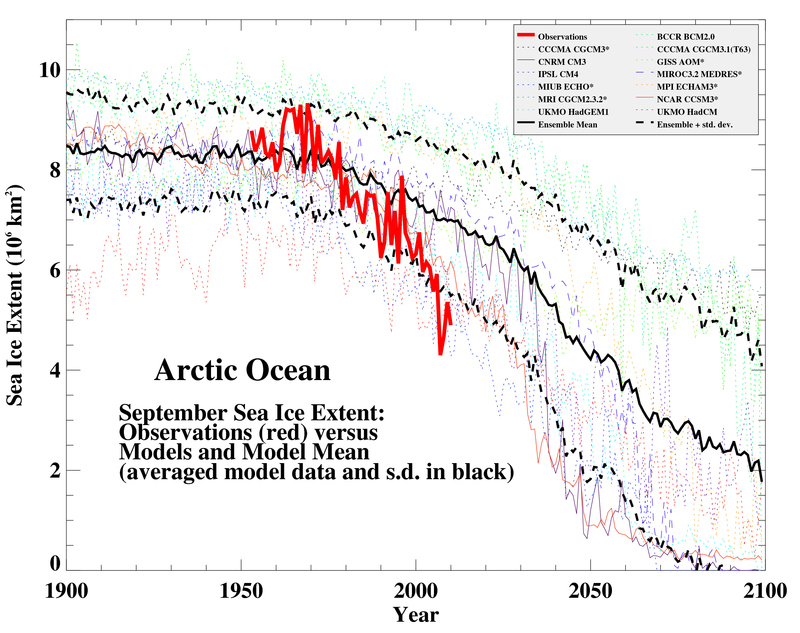 As before, it seems that the Hansen et al ‘B’ projection is likely running a little warm compared to the real world. Repeating the calculation from last year, assuming (again, a little recklessly) that the 27 yr trend scales linearly with the sensitivity and the forcing, we could use this mismatch to estimate a sensitivity for the real world. That would give us 4.2/(0.27*0.9) * 0.19=~ 3.3 ºC. And again, it’s interesting to note that the best estimate sensitivity deduced from this projection, is very close to what we think in any case. 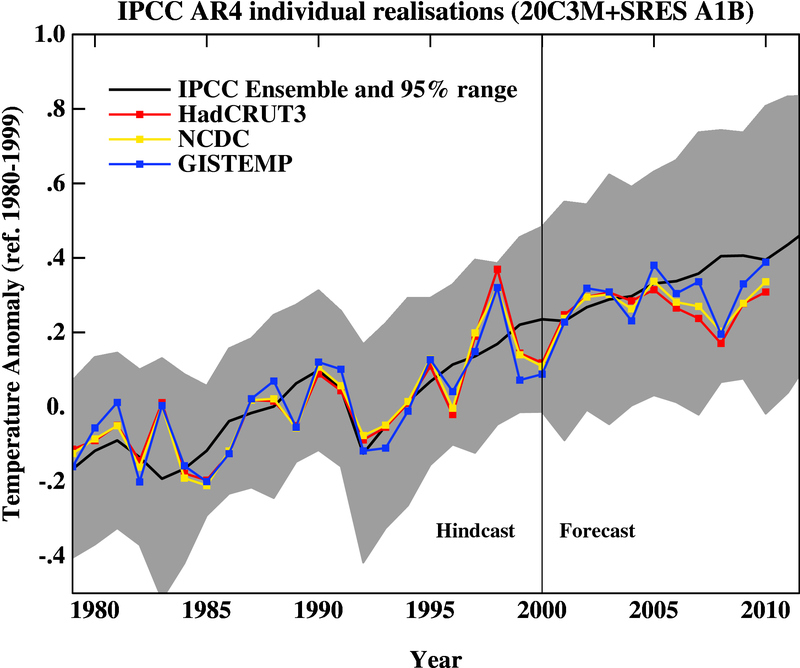 For reference, the trends in the AR4 models for the same period have a range 0.21+/-0.16 ºC/dec (95%). So to conclude, global warming continues. Did you really think it wouldn’t? Congressman John Shimkus (R-Il.) quotes the bible to explain why global warming will not be a problem. While this testimony occurred in congress a year ago, it is an excellent example of the rather complete disconnect between belief and ones own interpretation, and science.